Q: Can you tell me how much to budget for a one bedroom earth bag construction home? The labor is free. A: Earthbag construction can certainly be done for less than most methods of building, but it still costs quite a bit to finish any house. If you make domes, you can eliminate most of the cost of a roof. Earthbag construction does not necessarily need a conventional concrete foundation, which can also save a lot of money. Several years ago I built an earthbag house for about $16 a sq. ft....with my doing most of the work. 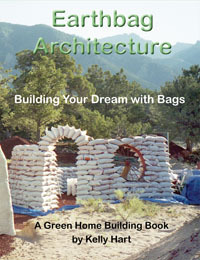 Q: I was wondering how much an earthbag home costs and how difficult they are to construct? A: Earthbag homes can be remarkably inexpensive to build, especially if they are simple, small, use mostly local free materials, and the labor to build is volunteer. Usually you can use the soil on site to fill the bags for the walls, so then all you need are the polypropylene bags (which are commonly available as feed and grain sacks around the world), some barbed wire, wood for door and window frames, possibly some cement or lime to stabilize the plaster, fish net for the plaster, and wood and metal for a roof. I think it is actually possible to build a small house for perhaps $1000 if you are very careful in collecting these materials...but at least for a few thousand. Much of the work involved in building can be unskilled, but of course it is nice to have an experienced person direct the action. Q: We would like to built in the future some of these buildings in Africa. What is the average cost of a school type building? A: It is hard to say how much a school type building might cost where you live. Certainly building with earthbags can be less expensive than many other methods of building. Often the earth at the building site can be used to fill the bags, and even used as part of the plaster over them. Other things like doors and windows will cost about the same no matter what type of building your are making. Also, if your design is a dome, or a series of domes, then you can avoid some of the costly materials of common roofs. Q: In the next year or so we're going to have an earthbag, earth-shelter home built in SW Oregon. Am I correct in assuming this will be less costly than concrete or construction methods? Could you give me an cost estimate for such a house, simply-finished, and about 1250 square feet? Q: I am contemplating buying a lot in the Kingdom of Tonga. I was told there is a dirt bag house that I could build for $5,000. Do you have any information on this particular house plan? I do not have a lot of money so am trying to do everything on the cheap. A: Earthbag building can be quite inexpensive, especially if you can do much of the work yourself or have friends or family willing to help you. Also, if you can find used or recycled parts at low cost, this can keep down the costs. We have quite a few plans available at this site, and if you chose one of the smaller ones, you might be able to build a complete house for $5,000. Here is a short article about economical housing. Q: How much do you think a single family 1500 sq ft house will cost and take to build? It seems to me it will take a few months to get all the walls, electrical, plumbing and septic done right? Are we sure it is still competitive price wise? I'm guessing this house may run $30000 while a conventional home would run $60000? Does that sound right? A: Using earthbags for the walls will likely save some money, but not that much. When you factor in all the work involved in building and plastering the walls, if you are paying for labor, it may not be that different. Earthbag houses can save a lot of money on the foundation, since they do not require a monolithic poured concrete foundation...if your local authorities will allow this. If you are doing most of the work yourself, then this might halve the cost of building. Q: Do you have any helpful information as it pertains to costs. My main areas that I am unsure about are: electrical and windows. A: The cost of windows and electrical elements of an earthbag house will be similar to any other house. It all depends on the design, layout, and choice of materials. If you can use recycled windows, it might save money. When I built my earthbag house I found that I could buy seconds, or glass that was made to the wrong size or never picked up at glass shops quite cheaply. Q: We just purchased a piece of land where we plan on building a home for us and each of our children (grown-ups now). In total we are planning on 5 structures: 4 homes 2bed/2bath each and a central Kitchen/dining/living area. Our "dirt" will be decomposed granite. Some of the houses will have partially underground portions, while some will be totally above ground. Since we all work in our family business, and will have available only weekends, we will have to hire labor to do most of the heavy lifting. What would be a reasonable budget? I see a few ways to go around this question. Either by sq ft or by lineal foot of bags laid. A: The cost of materials for the walls will mainly be for bags and barbed wire and plaster (which could also be earthen). Your main expenses will be for whatever you are using for doors, windows, plumbing, wiring, etc. All of these things are common to conventional houses in the area, so you should be able to query knowledgeable people in the area about it. Just off the top of my head I would expect that an experienced team of say three workers could put up and plaster one 24' dome in 3 - 4 weeks. You will know more after you have assembled one of them, given the local conditions, experience of the team, the need to dig or mix soil, etc. We would like to build 4 of the structures in approx 5-6 months not counting final finishes. In other words I would like to be able to move in in 6 months and finish after. I think that if you assemble the right team and they work hard this might be possible. It all goes faster with experience. Once you've done one you might discover that you need to add workers to keep on your schedule. Would it be necessary/worth it to pay someone experienced to come for a few days to help us polish the designs when we break ground. I think this might be true. That way you start off on the right foot, without making costly mistakes. Q: I have a dream of building a 30 ft hyperadobe roundhouse next summer. Do you think a budget of $2000 is enough for a 30ft roundhouse? A: (Kelly) I think that to build any house for $2000 dollars would be a real challenge, just because there are so many aspects that need to be covered in terms of electrical, plumbing, windows, doors, etc, along with the basic components of the shell of the building. A: (Owen Geiger) $2,000 is not realistic for a house that size. You're just thinking of the primary costs for the shell. My 18' earthbag roundhouse was $2,100 several years ago. It used local wood poles and thatch to cut costs. We could have reduced the cost some, but we wanted modern plumbing and electric, and some nice features. While anything is possible, a more realistic cost would be closer to $6,000 - $10,000, and that's with lots of recycled materials and local materials. Of course the cost could be much higher if you start buying lots of stuff. Remember, even local materials have hidden costs like gas and truck maintenance to gather them. Also, your time is worth something. Most people don't want to spend weeks doing something when they can buy something comparable for a few hundred dollars.